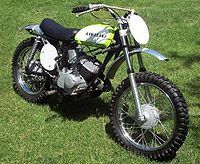 The Kawasaki F21M "Green Streak was a 238cc, 2-stoke off-road motorcycle manufactured by Kawasaki from 1967 through 1971 which competed in 250cc events. It accompanied its smaller, 100cc brother, the Kawasaki G31M as Kawasaki's available racers. Both had a very similar appearance. The F21M was Kawasaki's first attempt at building a flat track or off-road racing bike from the ground up and based on the Kawasaki F4. The F21M was advertised as the "Greenstreak 238" Scrambler. It was marketed mainly as a Tourist Trophy (TT), Scrambles and Flat Track motorcycle. Kawasaki dropped the 238 in favor of bikes that would sell to motocross riders. The Kawasaki F21M currently can participate in AHRMA sponsored events in the Sportsman 250 which 1974 and earlier machines up to 250cc, including like-design models. The F21M was replaced by the 250cc Kawasaki F81M. Years manufactured based on available parts listings.